If you’ve ever read the Crazy Rich Asians trilogy by Kevin Kwan, or watched the 2018 Crazy Rich Asians movie, you might imagine Singapore as an extremely affluent and ostentatious country full of extremely affluent and ostentatious people. Although modern Singapore’s rapid economic growth and high quality of life are no secret, international tourists usually experience a very different Singapore to the one portrayed in the books and movie. Ordinary Singaporeans typically present a humble, conservative and down to earth demeanour, and reside in modest government-subsidised apartments. They most certainly do not have broad British accents. Sure, there’s a fair number of Ferraris and Porsches driving on the roads, high rises as far as the eye can see, and more designer shops than you can visit in a lifetime, but local Singaporeans can’t be that crazy rich, can they? Either the books and movie got Singapore completely wrong, or there’s a secret side to Singapore that tourists don’t see. That’s what I hoped to uncover when I booked a Crazy Rich Asians tour through Tours by Locals. Let’s go find us some Crazy Rich Asians in Singapore! The Crazy Rich Asians tour is a 4-hour driving jaunt, with guide Phil, doubling as the resident chauffeur. We were collected from our downtown hotel and whisked away into the crazy rich neighbourhoods portrayed in the books and movie. Phil is a 4th generation Singaporean and knows the island nation inside out. Even so, he said hosting the Crazy Rich Asians tour is like going on a treasure hunt within his own country, using clues hidden inside Kevin Kwan’s hilarious story to uncover hangouts, restaurants, streets, buildings and accommodations usually reserved for the ultra-wealthy. Since the Crazy Rich Asians movie release in 2018, demand for the tour has gone through the roof. To cater to movie buffs like me, who haven’t read the books, Phil changed up his itinerary and now includes attractions like Marina Bay Sands and the Supertree Grove, which feature in the movie but not in the books. Most of the tour was spent in the car driving to areas just outside of the city center but there are enough stops to get out and stretch your legs. Of course, Crazy Rich Asians love their air-conditioned cars to escape Singapore’s heat and humidity, and we were no different. Are there Really Crazy Rich Asians in Singapore? Believe it or not, Singapore has the largest concentration of millionaires in the world, but this elite class only makes up 1% of the population. It’s no surprise that tourists can spend a week or two in Singapore without seeing a single sign of this extreme wealth. Drive along the streets of wealthier neighbourhoods, like Dempsey Hill, however, and it’s a completely different story. I got the feeling that even though Kevin Kwan’s characters are fictional, the lifestyles and personalities he portrayed are completely real. One of the first houses we drove past had not 1 but 5 red Ferraris parked out the front as well as a Lamborghini Reventon roadster, 1 of only 21 in the world and 3 in Singapore. Phil said the owner, an electronics manufacturer, opens his grandiose home every Chinese New Year so locals can admire his new possessions, many of which are rare collector items like the Lamborghini. Can you spot the red Ferraris? It’s no surprise that Kevin Kwan painted such an accurate picture of the lavish lifestyles of Singapore’s elite, since he grew up in one of these wealthy neighbourhoods himself. Phil said the books hold a few clues about the people or families Kwan may have had in mind when crafting his characters. Savvy Singaporeans can spot them out if they know what to look for. Praise the lard. Yep, they’ve got a sense of humour too. The mansions in the Crazy Rich Asians movie would be ridiculously expensive anywhere in the world, let alone on the small island of Singapore where land is in high demand and priced at a premium. With that in mind, I was quite surprised to discover almost every home in Kevin Kwan’s books is based on a real Singaporean home. We stopped by the house filmed as Peik Lin Goh’s family home in the movie. It’s is currently up for rent and Phil expects it will bring in $30-45k per month for it’s owner. That’s not because the movie made it famous, that’s just what houses cost in Dempsey Hill. And the same house in the movie. I’d like a gold fountain too, please. Next, we stopped by the “star trek house”, which is where the book places Eleanor Young’s bible study groups. The house is not like any other on the street and is unmistakably the “sprawling glass and steel structure” described in the novel, but I thought it looked more like a nightclub than a home! The only house that may not be based on a real home is Ah Ma’s house, make that a palace. Those scenes were filmed in Malaysia for the movie, but Phil has a few suspicions of which house Kwan had in mind when writing about Nick Young’s childhood home. He pointed them out as we drove by. According to Phil, houses around Dempsey Hill (just one of Singapore’s prestigious neighbourhoods) sell for between $20 million and $300 million while a plot of land recently sold for $90 million. As if that’s not crazy rich enough, some residents own multiple properties in the same area and either lease them or let their extended families live in them. What about Crazy Rich Attractions? Despite the flashy cars and homes, Singapore’s elite actually like to be discreet about their wealth. 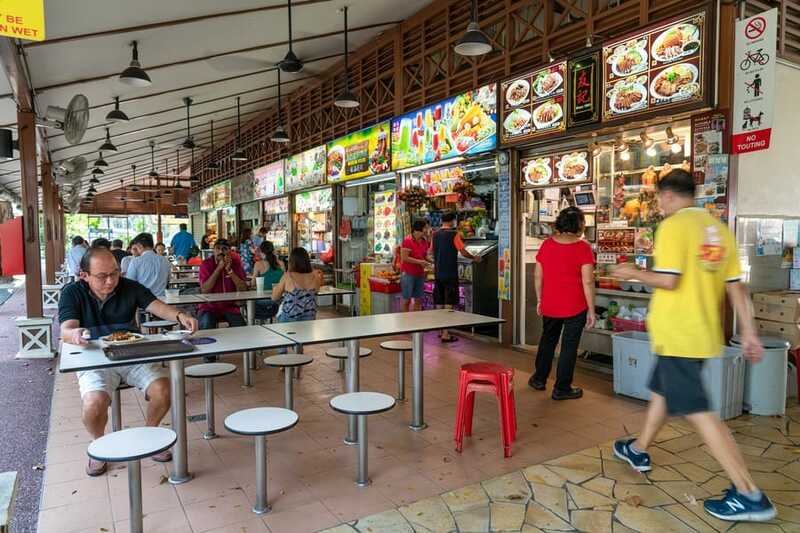 It’s not uncommon to find them in unsuspecting t-shirts and slippers enjoying a $3 meal at a hawker’s marker. Just like Nick and Colin did in the movie. 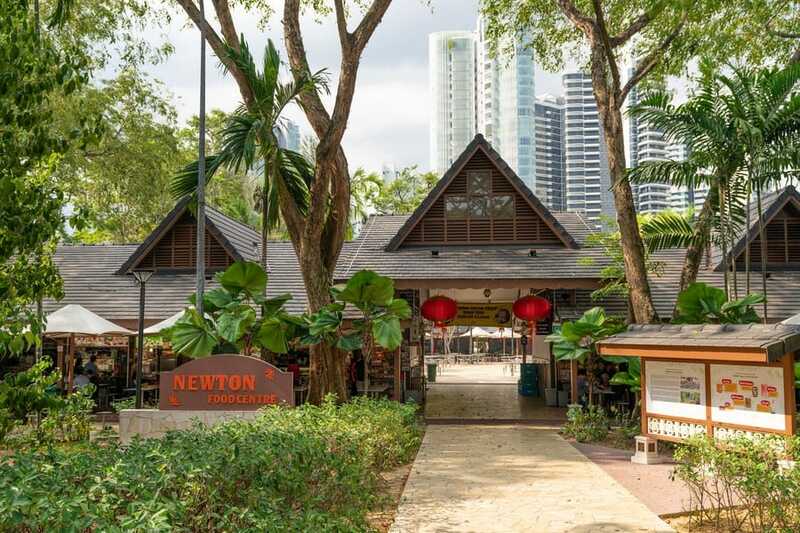 The next stop on our tour was the Newton Food Centre, the hawker’s market from the movie. 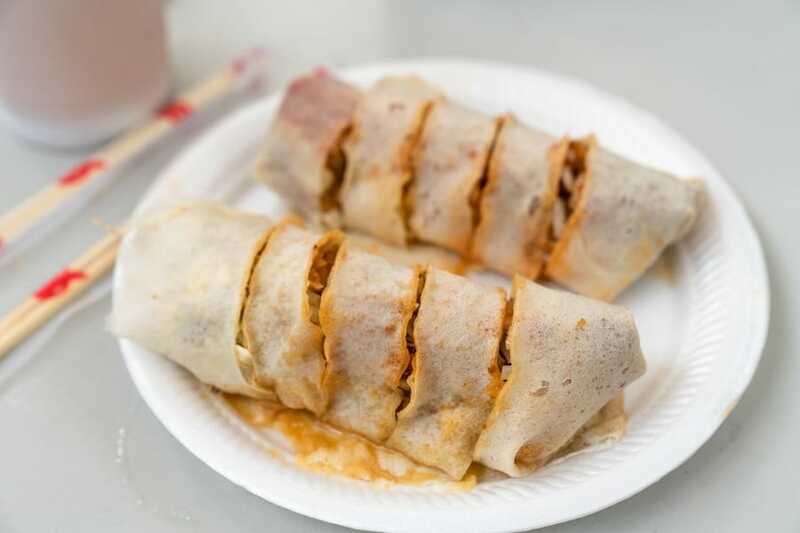 We arrived at 4pm so many food vendors weren’t open yet, but I managed to find a tasty fresh fruit juice and a plate of popiah, my favourite Singaporean meal. Sadly, Phil said hugging stall owners like Nick does in the movie is a cultural faux pas, so I didn’t try to re-enact that scene. 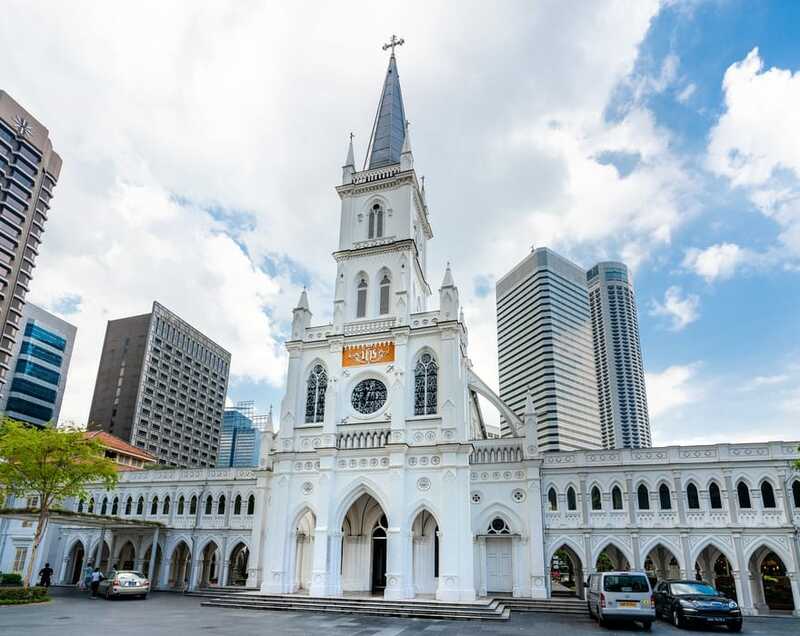 Another recognisable scene from the movie was CHIJMES, where Colin and Araminta’s wedding ceremony was filmed. 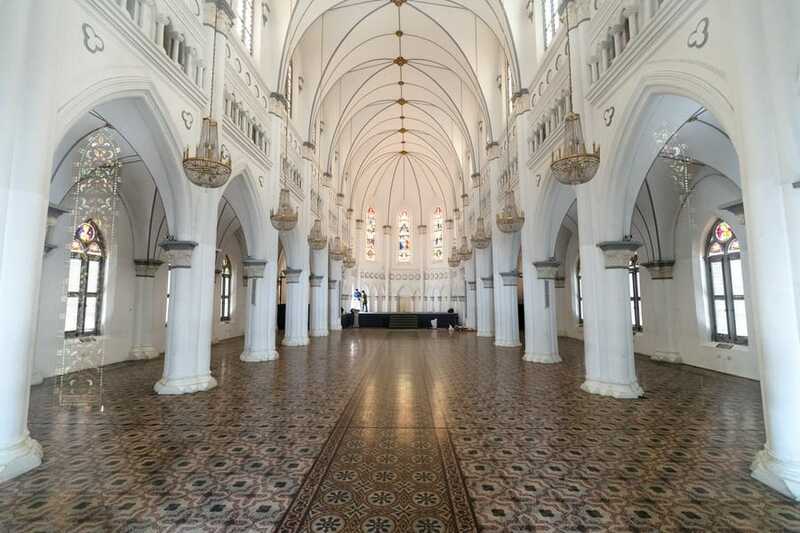 CHIJMES is no longer an actual church but used as a function hall, primarily for weddings, but without water flowing down the aisle. What you don’t see in the movie is that just behind the church you’ll find a trendy dining complex with taverns, restaurants, bars, and a grassed area with bean bags. We didn’t have time to stop for a drink on our tour, but it’s definitely worth coming back to this hip, laid back area in your own time. Seeing the complex up close let me understand the scale of the shutdown required to film the wedding scene at CHIJMES. On a sidenote, Phil mentioned that all of the scenes shot in Singapore were filmed in only one week! The rest of the movie was filmed in Malaysia. Since the tour is somewhat customisable, Phil can take his guests to other attractions that feature in the movie and books, like Marina Bay Sands, the Supertree Grove, and the Singapore Botanic Gardens. I’d already seen these before my tour, so Phil decided to show me more of the finer things reserved for Singapore’s elite. We visited (only on the outside) private country clubs and gentlemen’s clubs, a condominium with an elevator for cars, and my favourite, a giant vending machine full of luxury cars. Yes, you read that correctly. The multilevel garage houses dozens of Porches, Mercedes, Range Rovers, and the likes, all stacked on top of each other on mechanical floors. Buyers select the make, model and colour they want to view on an iPad at ground level and the car is brought down to spin in front of them for a 360° view. If the buyer likes what they see, they wire the funds then and there and drive off in their brand-new sports car. Singapore is one of the most expensive countries to own a car since owners must pay a hefty licence on top of the purchase price (which is more than 2 times higher than other countries), and the licence is only valid for 10 years. Taking all of that into consideration, you get an understanding of the kind of customer who’d want to, and be able to, purchase a sports car from a giant vending machine. To the unsuspecting tourist, Singapore may appear to be just like any other modern, innovative, and prosperous city, but don’t fooled. Singapore has hidden class of crazy rich elites. If you’ve visited Singapore before, or perhaps have a spare day up your sleeve, I highly recommend going on this Crazy Rich Asians tour. You’ll discover a side of Singapore unknown to the average visitor and out of reach to the average human. Even if it’s for only one day, you can be a Crazy Rich Asian too. Feeling inspired? Read the books (Kindle version available) and watch the movie online. Your guide didn't read the book. The book clearly put the Young estate by the Botanic Gardens on Tyersall Ave. The estate is called Tyersall Park. You can see the huge green space and Tyersall Ave on Google Earth. There's an abandoned palace (Istana Woodneuk) owned by a Malaysian prince in the middle. That's the inspiration for Tyersall Park. Bloomberg recently has an article about this place. It says the land is zoned as green space reserve. If the land is allowed to be developed, it will be valued $3.5 billions due to its size and location. Another mistake he made is Eleanor's house. That house is in Malaysia.